What Is the Lifespan of a Weeping Willow? 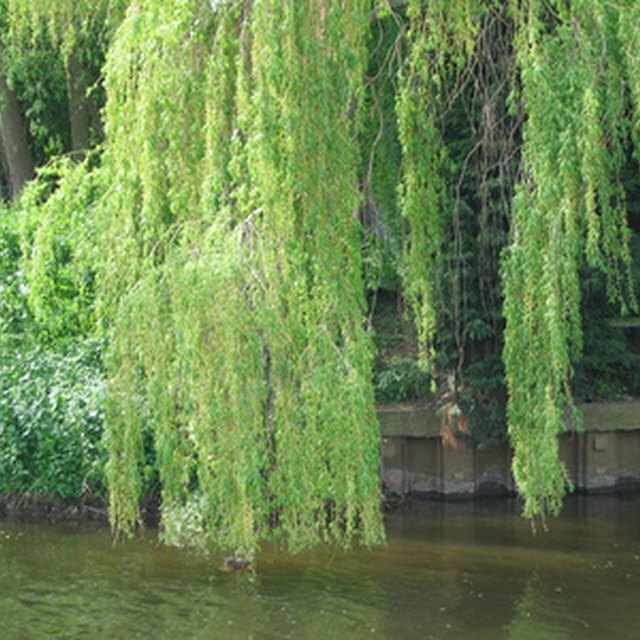 With its elegant form and pendulous branches, the weeping willow (Salix spp.) is a beautiful, calming tree. However, weeping willows are not suitable as backyard trees unless you have a lot of space to accommodate them. The tree itself can reach a height and spread of 45 to 70 feet, and it has extremely invasive, shallow roots. If you have a willow plant in your yard, make sure you know what it needs to thrive, and what problems you may encounter. Weeping willow tree roots are aggressive, invasive and shallow, and they can spread up to three times the length of the tree (from the trunk to the canopy). The roots often lie close to the soil surface, causing bumps in the lawn, which interferes with mowing. They can also lift cement patios. Weeping willow tree roots can also damage underground water, sewer and plumbing lines. Never plant a weeping willow (or any other tree with a huge root system) near a septic tank drain field, as the roots could cause major damage. If you plant a willow tree in your backyard, make sure it is at least 50 feet away from your house and any other nearby buildings, plus any underground sewage, gas, water or electrical lines. Weeping willow trees are best planted where there is plenty of space for it to grow, preferably near water where soil will be undisturbed. 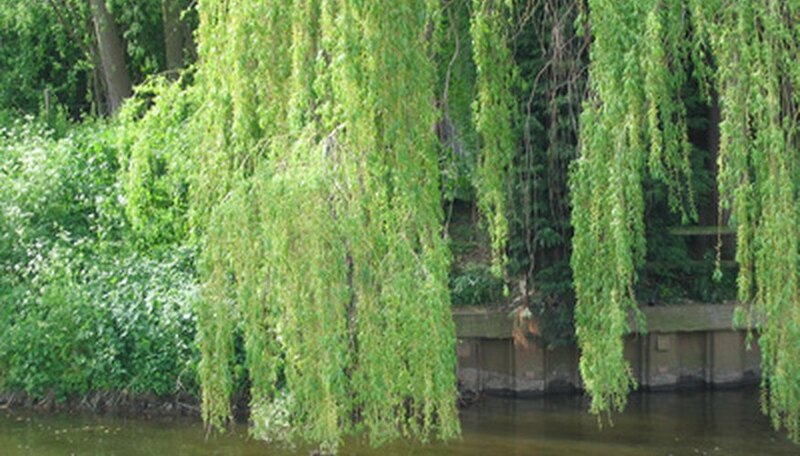 Weeping willows thrive in full sun or very light shade. They can survive in a range of soil conditions, including alkaline pH. All willow trees are short-lived (about 30 to 50 years depending on how much space they have to grow and how abundant their water supply is), so initial pruning is necessary to help a weeping willow grow a strong trunk and wide branch crotches. Besides the weeping willow, other types of willow tree include the "Golden Curls" willow, which is slightly weeping and has golden bark; the "Aurea" willow, which has golden-yellow branches; and the corkscrew willow (Salix matsudana "Tortuosa"), a willow tree with twisted branches and an upright form. The corkscrew willow has a shorter spread than the weeping willow (15 to 20 feet compared to a height of 25 to 35 feet) and its roots are less invasive, although they may still become a problem as the tree ages. Like the weeping willow, the corkscrew willow prefers moist areas, but it is more tolerant of drought. University of Maryland Extension: How Close Can I Plant Trees? Bower & Branch: Should I Plant a Weeping Willow? Gillespie, Claire. "The Root System of a Weeping Willow." Sciencing, https://sciencing.com/root-system-weeping-willow-6300180.html. 25 July 2018.